How many times have you complained about how far our darling Kempegowda International Airport (KIAL) is? If you’re like us, then it’s probably every single time you either had to catch a flight, returned from a holiday or had to go pick/drop someone from it. And at about 40 kms from town centre, it’s understandable. But what if we told you, that instead of just going to the airport and back, you could make a day of it with some pretty cool activities (golf or zorbing, anyone? ), sites and spas in the area? Now you’re wondering why you didn’t think of it earlier! See, Devanahalli isn’t so bad after all! Head to Ai Cavalli and you won’t be disappointed (a day’s notice is required). Located in Embassy International Riding School, this is where you can sit back and admire the graceful horses from a distance while you tuck into their homely Italian fare. We suggest you start off with the classic Bruschetta here before turning your attention to the creamy Spaghetti Carbonara. Read more about the place here. Whether you’re looking for a picnic spot or just a quick getaway, Nandi Hills fits the bill. From the long drive (brace yourself for those hairpin bends!) to the refreshing air and breathtaking views, there’s plenty here to take your mind off the buzz in the city. While you’re at it, make sure to check out Tipu’s Drop, where Tipu Sultan is rumoured to have had many a prisoner kicked off. Wondering why a temple is worth the trip? Well, for starters, Bhoga Nandeeshwara Temple, located at the base of Nandi Hills, is over 1,000 years old and probably the oldest temple in the state. Dedicated to the Hindu god, Shiva, the holy spot boasts of detailed architecture featuring intricate carvings, ornate pillars and sculptures. By the time you explore the stepped temple tank and spend a while marvelling over its history, we’re guessing you’ll have a newfound love for ancient temples. Located along the Bangalore-Hyderabad highway (after the airport), Indian Paratha Company has lipsmacking desi parathas to lure you there. Want something more than the good old Aloo Paratha? Try the spicy, mango-pickle-filled Achari Masti Paratha or the Soya Kheema version. They also have Parathzzas (parathas in pizza avatar) which come with toppings like aloo cheese, paneer tikka and mushroom corn. All to be washed down with tumblers of lassi or chai. Wave pools, waterslides, trampolines and toy trains – Lumbini Gardens has it all, and more. Built around the Nagavara Lake, the amusement park has boat rides to sign up for as well as amusement rides to promise you a fun time. When you’ve had your fill of all the entertainment, pick a spot on their lakefront seating and sit back to enjoy the view. Or perhaps a refreshing walk around the park? Before you leave, drop by Golden Pearl, the floating restaurant (first of its kind in the city). Quite close to the airport, Devanahalli Fort stands tall, a quiet symbol of history amidst the present chaos of the city. Marked by a memorial outside the fort, this is also believed to be the birthplace of Tipu Sultan. What’s more, you can even see the place where the erstwhile rulers, Hyder Ali and Tipu Sultan lived. Walk in through one of the small entrances decorated with cut plasterwork and you’ll be greeted by a vast area, neatly demarcated for the temples inside the fort (including the famous Venu Gopalaswamy Temple). Literally a hop, skip and jump from the arrival gates, the brand new Taj looms in its luxe glory across the car park. So if you’re a transit passenger who’s looking for a good night’s rest or just picking or dropping off a traveller, this is a great option. While there is Café 77 East, the multicuisine all-day coffee shop, Tamarind, the North Indian restaurant and Soi & Sake, the sushi and teppanyaki bar, we recommend the Anti-Jetlag menu which curates healthy and revitalising food for the person on the go. A quick and relaxing massage at Jiva Spa here will also not go amiss. Pampering never harmed anyone! 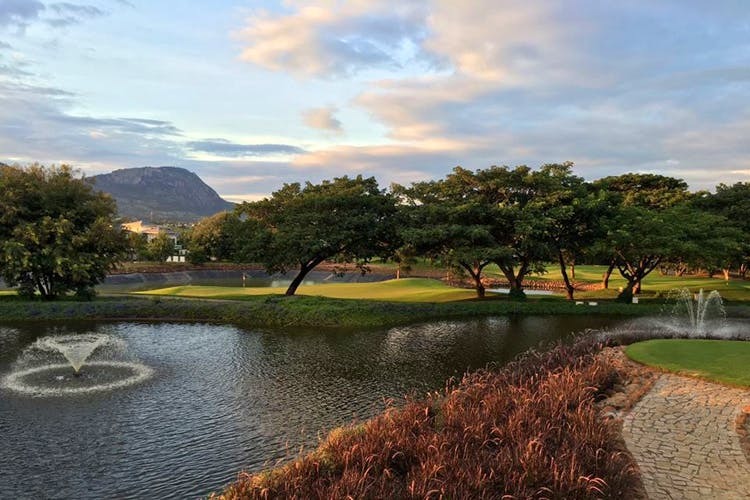 Play golf in style at this 18-hole course that’s just about 15 minutes from KIAL. What is really lovely about this course is that it’s semi-private so you can almost tee off at any time you like. Throw in a restaurant that serves up everything from Kathi Rolls and Char-Grilled Prawns to pancakes and roast chicken, and it’s like you’re on vacation. Beer, cocktails and a marvellous view of Nandi Hills only makes it better. For those in a real hurry, book yourself a nine-hole course, at half the cost. Do remember that the course is closed on Mondays. If you’ve got kids in tow, nothing like a few water slides and a good tuck in to a wholesome buffet to keep them calm and flight ready! Clarks Exotica will fit the bill nicely. Apart from the water slides, the swimming pool as a bar in it for the adults to unwind too. They even have a badminton court, a gym for the fitness buff and snooker to keep you entertained. With room tariffs not too exorbitant, check in here before an early morning flight so you don’t need to wake up really early to traverse the length of the city. Kick into the holiday spirit before getting on the flight even, seems like a win-win situation! For those dropping family off at the airport, we recommend leaving a day in advance. Why? So you can check into Windflower Prakruthi, of course! With a serene seven-acres too wander about and explore, it’ll only do your nerves good. But more importantly, they have an activity zone that’s exciting for kids and adults at heart. Zip around on their BMX bikes or go off-roading on the ATRs. We personally like Zorbing and Paintballing here. Oh! And such dreamy Balinese massages. And Ayurvedic ones too! Now you’re going to offer to pick up all your guests from the airport aren’t you? Get all the details here.